HDPE Poly Lock is a rugged, durable HDPE profile that can be cast-in-place or inserted into wet concrete, leaving the welding surface exposed upon completion of concrete preparation.Â HDPE Poly Locks are proven solutions for attaching HDPE geomembrane in Steel and concrete tanks must be protected internally and externally to make sure that nothing gets out and nothing gets in. For more than 30 years, industrial and municipal professionals have relied on products and services to protect their concrete and steel tanks from corrosion and leakage. HDPE geomembranes andÂ concrete protection productsÂ have been installed inside steel and concrete tanks of all sizes to preserve aging tanks and protect the tank walls from corrosion. For potable water tank liners, the geomembrane prevents contaminants or sediment from entering the tank..
HDPE geomembranesÂ can be attached to steel or concrete tank walls using stainless steel batten strips. For concrete foundations, attach geomembrane securely and more economically withÂ HDPE Poly Locks concrete embedment attachment strips. StudLiner HDPE, aÂ concrete protective liner product, is available in a range of thicknesses and configurations for specific applications. Geomembrane technology can also help with tank protection. A Conductive liner system can be completely spark-tested once installed to find liner damage, and in the case of exposed installations can be retested periodically for long-term maintenance. HDPE geomembrane lining systems are the preferred choice for providing corrosion protection to concrete and steel tank surfaces. For leak detection, HDPE geomembrane liners are generally installed in conjunction with aÂ drainage geocompositeÂ inside the ringwall. The two layers help to quickly channel leaked liquids to a leak detection sump. 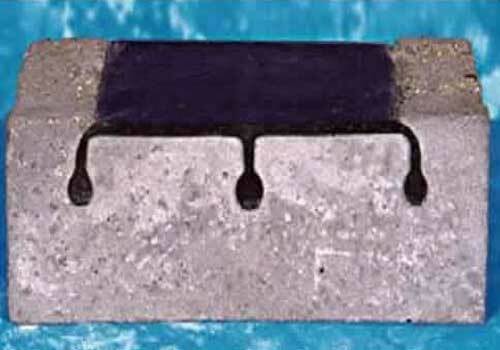 Attach standard Â geomembrane sheeting to the concrete surface with batten strips or E PolyLock concrete embedment strips. HDPE materials and technology are also the industry choice for secondary protection and spill containment. From small tanks to entire tank farms, geomembranes have been proven in many secondary containment area applications. Install Â StudLiner concrete protective liner systems into new concrete or to existing concrete with injected mortar. Â StudLinerâ��s extruded studs lock into the concrete for a tight, smooth and rigid surface.